Long, straight hair, lipstick that comes and goes, and an ironically macabre career—exploring unassuming but totally awesome Molly Hooper is a journey that starts with specific stories framed by the creators of the BBC’s Sherlock, finds its anchor in the Sherlock Holmes canon as a whole, and winds up the wider genre of procedural mysteries. 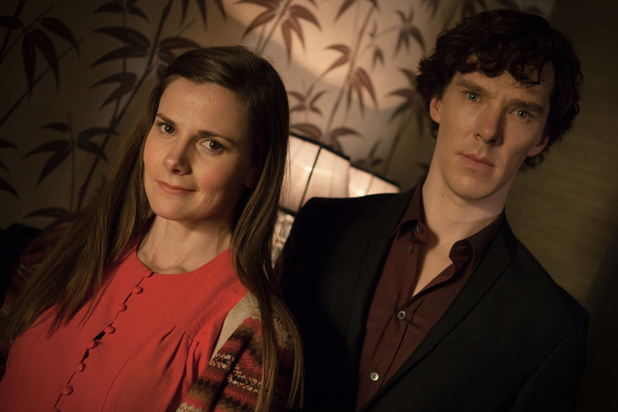 At the beginning of A Study in Pink, Molly Hooper is first introduced as a contrast to and amplifier of Sherlock’s character. His abrupt, almost alien behavior as he flogs a corpse and fails to notice any normal social signals is contrasted sharply with Molly’s slight attempt at humor and shy flirtation. She immediately gives the viewer a window into the detective’s differences from the rest of the world—a world where a woman’s attempt to impress a man with lipstick would be appreciated at best and ignored at worst. In Sherlock’s world, however, facts come first, no matter what, even when it comes to the size of a woman’s mouth. At the same time, Molly shows herself to be more persevering than one might expect, since she doesn’t give up on Sherlock. Molly may intermittently act as Sherlock’s dupe, but she’s not an entirely oblivious victim. Along with other major arcs of the series, Molly’s story comes to a head first in The Great Game, when she is shown to be the unwitting pawn of two extremely clever men, neither of whom is terribly scrupulous about using her for his own ends. Sherlock once again hurts her by abruptly pointing out that her boyfriend is gay, though his offensiveness is apparently unintentional in this case. Jim’s use of her is far colder and more sinister, as she becomes a part of his deadly game. The cliffhanger at the end of the series leaves Molly hanging as much as the other characters—a woman with a preference for two men who use her, but at the same time a competent career woman who isn’t as gullible as she seems. Through the next two series, her character grows enormously. The revelation of Molly’s true importance in Sherlock’s second series, particularly throughout The Reichenbach Fall, certainly met and then exceeded fans’ wildest hopes. Previously, Molly’s humiliation at the Christmas party in A Scandal in Belgravia had revealed an unexpectedly contrite, even sweet, side of Holmes. Later on, her perceptiveness regarding his true mental state (“You look sad when you think he can’t see you”) helped him to understand her value. Finally, in the end, when even Watson had to be kept in the dark, Holmes looked to her for help. By series three, Molly has become a formidable ally for Sherlock and a woman who realizes her own strength to the point that she’s willing to take him to task for his substance abuse. Also, through windows into Sherlock’s mind palace, she’s shown to be a permanent part of his mental processes, his respect of her so great that she represents all medical knowledge to him. In the first series of Sherlock, Molly was a humorous character with a great deal of potential. In the subsequent series, she revealed her true nature as a multi-faceted, faithful, and intelligent woman. Her future in the show is certainly something to anticipate. Virtually every incarnation of Sherlock Holmes shares the common characteristic of willingness to use innocent people to accomplish his own ends, and the BBC version expresses this quality no more ruthlessly than his original predecessor. Most of Sherlock’s flaws—such as pipe smoking, drug use, and some aspects of his sociopathy—have been portrayed as glamorous and attractive in various books and films, to the point that in many cases, they have become like backhanded strengths. His selfish, borderline-exploitation of other people, as exemplified in his treatment of Molly, however, is impossible to glamorize. In simple terms, at the beginning of the series, Molly showed the viewer an ugly side of Sherlock, one that is absolutely necessary to the character. Without true flaws, Sherlock Holmes is a caricature—an impossibly heroic genius who is good at everything and even successfully controls his vices. Molly’s frequent presence on the show is a reminder that the world’s only consulting detective can be selfish, thoughtless, and occasionally cruel. He may be a hero, but he is also an anti-hero, a duality that makes him one of the most intriguing characters in the world. As the series progresses, however, Molly’s growth takes her from a dupe to a queen, a woman whose ability to stand up for herself and for what is best for her friends ultimately affects Sherlock’s own character. He becomes a better person as a result of trusting and knowing her. The concept of flawed heroes runs through all of literature, film, and television, but mystery novels and shows have made the concept of the heroic antihero an art form. Larger-than-life detectives bring larger-than-life vices to the cases they solve. Dr. House has his Vicodin, Flavia de Luce her vindictiveness, Adrian Monk his obsessive compulsions. Arguably, most of these characters are the descendents of Sherlock Holmes, attempts by authors to capture the complex interplay of light and dark that makes up Conan Doyle’s hero. The creators of the BBC’s Sherlock have seen fit to soften their hero’s smoking habit and take away his drug use almost entirely. Molly is essential to the show because she highlights what makes Sherlock so very imperfect—his frequent lack of understanding of people or concern for them. The things she amplifies in him make him a reflection not only of Conan Doyle’s original source, but also of the mystery genre as a whole, a gray-shaded world of flawed heroes. And yet, there’s something a little bit different about Molly Hooper, a little bit independent, a little bit unwilling to give up, something in her that ends up surprising even Sherlock Holmes.